With the U.S. economy enjoying the longest bull market run in history, the rising tide of interest rates threatens to pop the booming economic bubble as the demand for loans bump up against the Federal Reserve’s tightening. 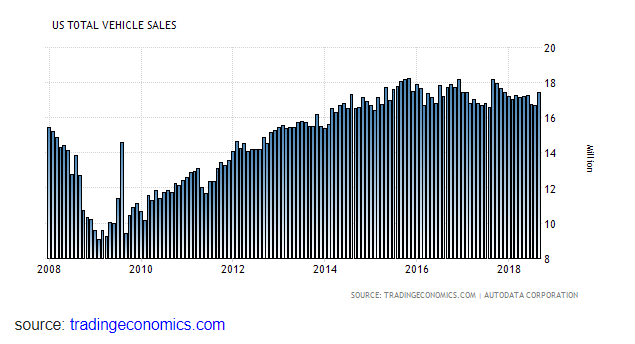 A recent article on DollarCollapse.com points to rising mortgage rates sinking affordability for home buyers, and tanking auto sales as the latest example of a market on the brink of collapse. At first the effect on the broader economy is minimal, so consumers, companies and governments don’t let a slight uptick in financing costs interfere with their borrowing and spending. But eventually rising rates begin to bite and borrowers get skittish, throwing the leverage machine into reverse and producing an equities bear market and Main Street recession. The housing boom is quieting down after the past couple of big years that saw mortgage rates in the 3 to 4 percent range, making houses widely affordable. Demand has exceeded supply, pushing prices up to the point of passing the 2006 bubble levels in places like Denver and Seattle. But mortgages hit 5 percent this week for the first time in eight years. The average rate on the 30-year fixed loan sat just below 4 percent a year ago, after dropping below 3.5 percent in 2016. It just crossed the 5 percent mark, according to Mortgage News Daily. That is the first time in 8 years, and it is poised to move higher. Five percent may still be historically cheap, but higher rates, combined with other challenges facing today’s housing market could cause potential buyers to pull back. Home sales have been sliding for much of this year, and total annual sales are expected to come in lower than last year. Affordability is the clear culprit. With rates now more than a full percentage point higher than a year ago, that adds at least $200 more to a monthly mortgage payment for a $300,000 loan. It also knocks some borrowers out of qualification because lenders are strict on how much debt a borrower can carry in relation to his or her income. The same goes for auto loans, as 0 percent interest deals that produced the highest sales ever in 2016 are disappearing. Ford even announced an 11 percent decrease in monthly sales just this week. Everyone who could possibly qualify for a 7-year car mortgage has done so, depleting the pool of potential buyers. And interest rates have risen enough to make it uneconomic for car companies to keep offering yesterday’s crazy-low rates. 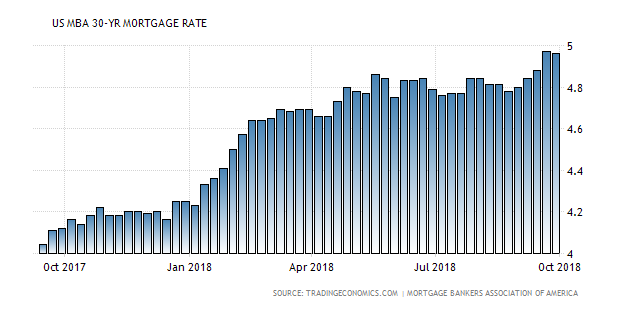 So the millions of Americans who were happily taking advantage of previously low interest rates in the housing and auto markets have dried up. In turn, companies selling cars and houses are desperately trying to cut expenses as projections decline. Suppliers are in turn scaling back, leading two major U.S. industries to go from boom to bust, and it’s just the tip of the iceberg with the Federal Reserve signaling another rate hike in December followed by three more projected for 2019.